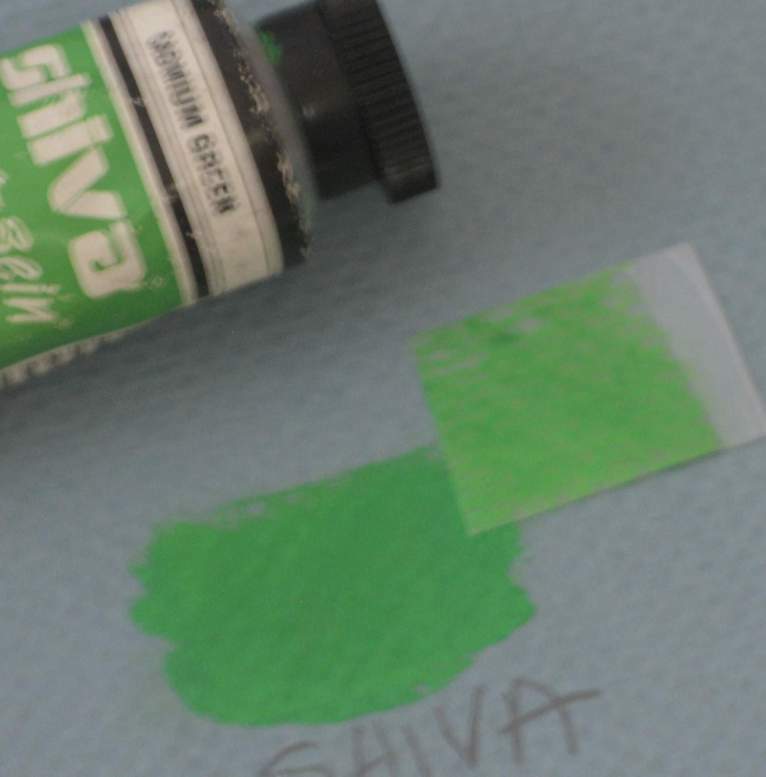 To follow up on my previous post, I had found that one of my Richeson/Shiva paints, Cadmium Green, transferred to a dry paper towel with just some light rubbing after the paint had dried. Now I wanted to see if other tubes I owned had this same problem. They do. This picture shows a sheet of paper on which I painted 1 inch swatches of all the different tubes of Shiva paints I have. The paper towel at the bottom shows pigment from each swatch that transferred over. 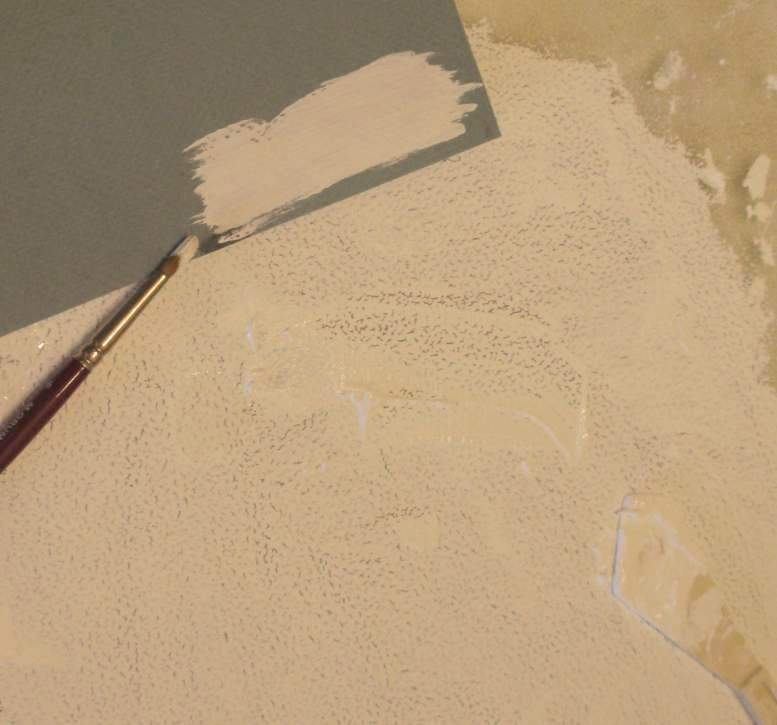 I did not dilute the paint at all with water, and did not apply the paint too thickly. All of the paints smeared easily when rubbed, some more than others, with the sole exception of the Raw Sienna. The ivory black in particular smeared very badly, and even after a day of drying felt to have a weak paint film. 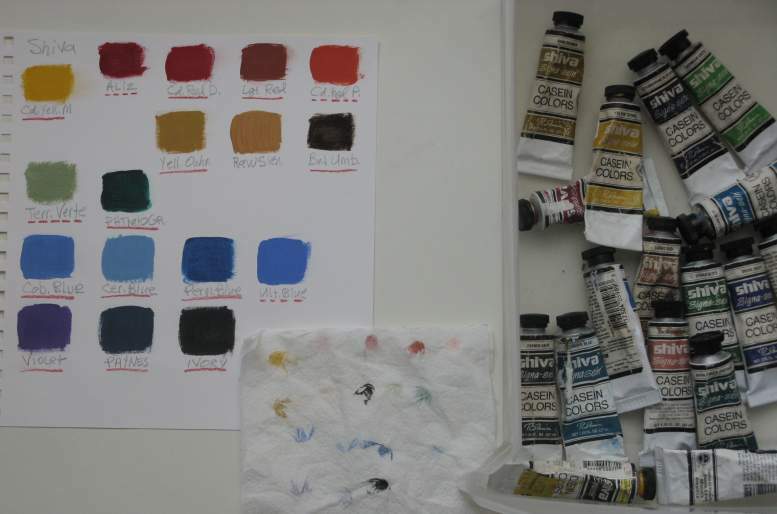 Since all of the paints are old, in some cases decades old, I asked around to other people who used these paints if they could test any tubes they might have that are newer, and see if they had the same problem. I heard back from a couple people. One person had some Richeson caseins that were only months old, and found they had the exact same pigment transfer problem. The other artist rubbed the surface of paintings he had made that were at least 3 months old, and said no paint at all rubbed off. What this tells me is it might be possible that if the paint is allowed to cure for awhile longer, the pigment will adhere better and not rub off. This strikes me as a strong possibility. So, I think I’ll do a new test on paint swatches that sat undisturbed for a month or more, and then see if any pigment rubs off. 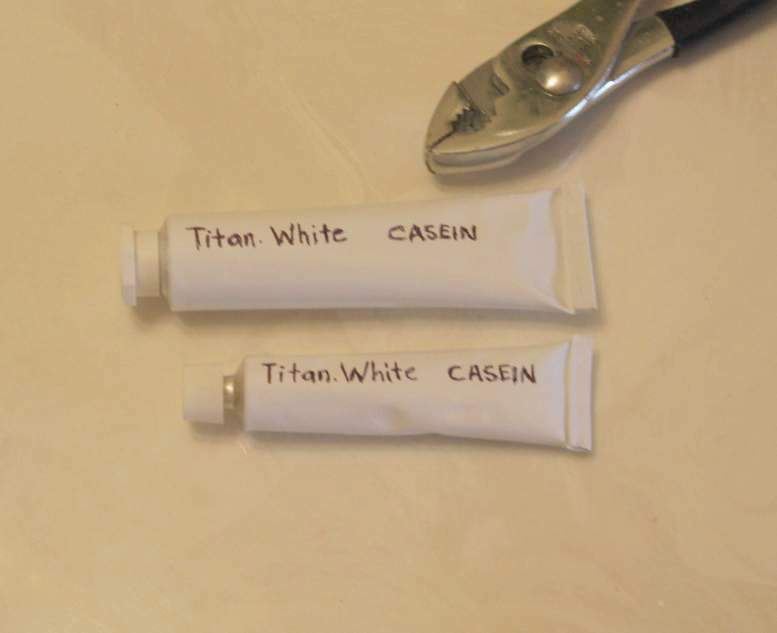 I wanted to follow up on my previous post where I made my own casein white paint, and see how well it compares to tubes of the Shiva paint I had, and discovered something interesting. I used the paint swatch I made testing my paint on a sheet of Strathmore textured “Art Paper” 65lb. 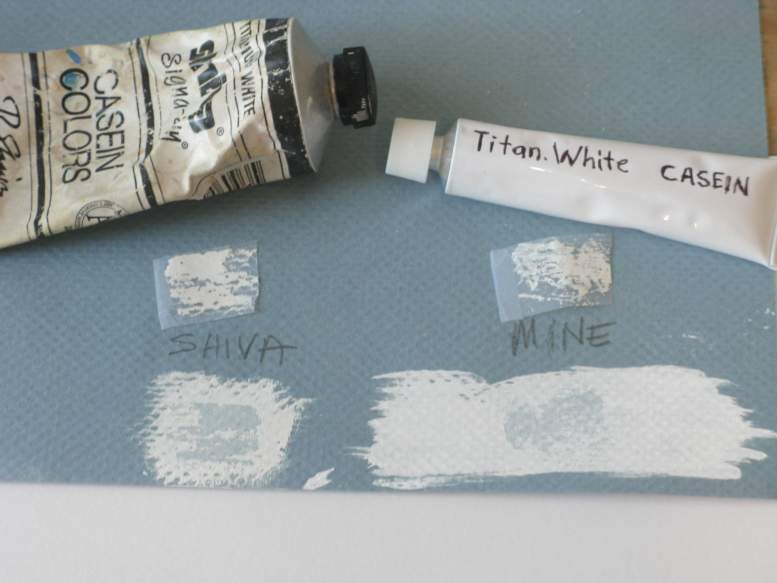 I painted a small swatch of the Shiva titanium white, undiluted, next to the swatch of mine I had made. It may be hard to tell in this photo, but I noticed their white has a slight off-white yellowish tint to it that mine does not. I let this dry for a day, and came back and gave both a buffing with some colored fabric, and saw no transfer of pigment from either swatch. Next I placed a small piece of cellophane tape over each one, rubbed it, and removed the tape. Both transferred some paint, but more paint came off the Shiva swatch, lifting almost all the paint from the paper. The casein binder I used to make my paint was over a year old, so later I’ll see if a fresher batch performs better. 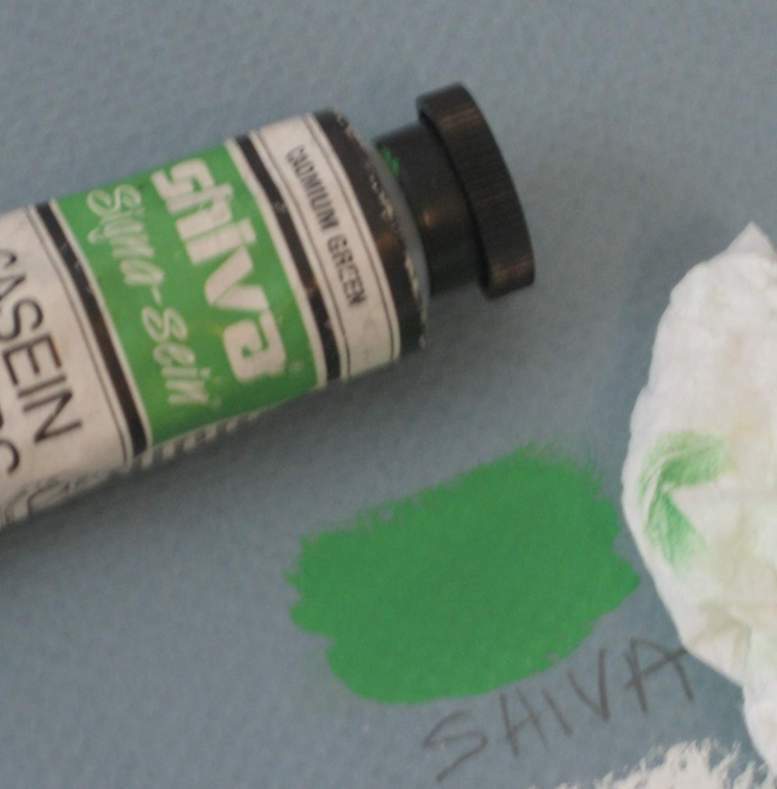 Since that tube of Shiva white is many years old, I thought I’d test a newer tube of Cadmium Green that I had to see if it performed any better. Rather surprisingly the pigment adhesion was worse. I let that paint swatch dry for about 3 hours, and rubbed the surface with a paper towel. You can see quite a bit of pigment rubbed off. The tape test pulled off quite a bit of pigment also, and the way the pigment transferred was not in sections of paint, but powdery like what I saw on the paper towel. This tells me that the adhesion on this tube of Shiva paint is poor. Granted, it’s about 5 years old or so, but it shouldn’t come off this easily. I have commercial tubes of gouache that adhere better than this. I hope the newer Richeson brand of Shiva adheres better. Now I want to test the rest of the Shiva paints I have. This is not terrible, but surprising. This paint adhesion is not much better than soft pastel. I’ve been wanting to get back to using one of my favorite paint mediums for awhile, casein. I took an inventory of the tubes I had available for my next project, and noticed I was short or low on a few colors, particularly titanium white, so it’s time to make some more. I have a bathroom next to my studio space that I use exclusively for this type of work, so I clean off an area by the sink, and set up my tools and supplies. I have a large sheet of textured glass that I use for mixing the paint. 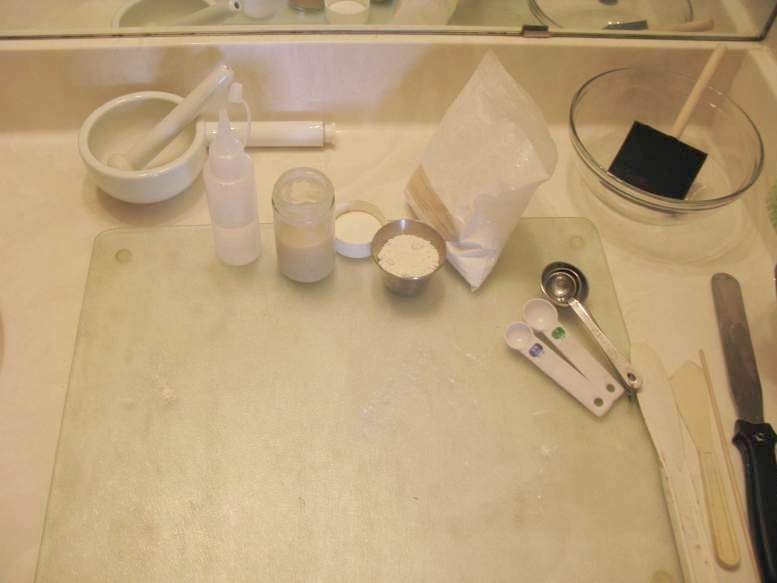 There’s a mortar and pestle for smoothing the dry pigment, an empty tube for the paint, a squirt bottle of distilled water, about 4 ounces of casein binder, and white pigment. 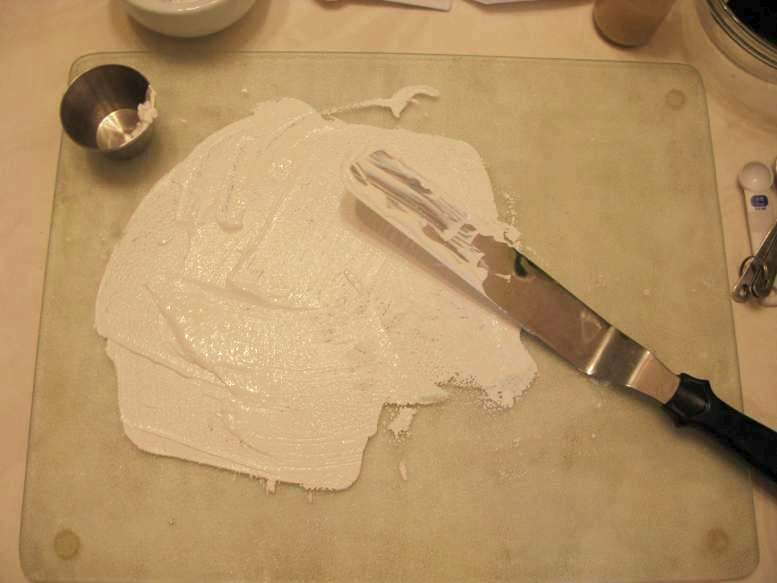 The pigment is a little lumpy, so I use the pestle to break it down some, and place about 2.5 tablespoons of pigment on the glass with about 2 teaspoons of binder and just enough water to get the consistency of paint I want, and spend a few minutes with the spatula smoothing it out. I test the paint I’ve mixed to see if it spreads easily with a brush without having to add any water, and check the opacity on this sheet of colored paper. It looks fine, so I repeat these steps about 2 more times to make more paint to fill the tube. There’s enough paint now to fill up this 50ml tube and another 22ml. 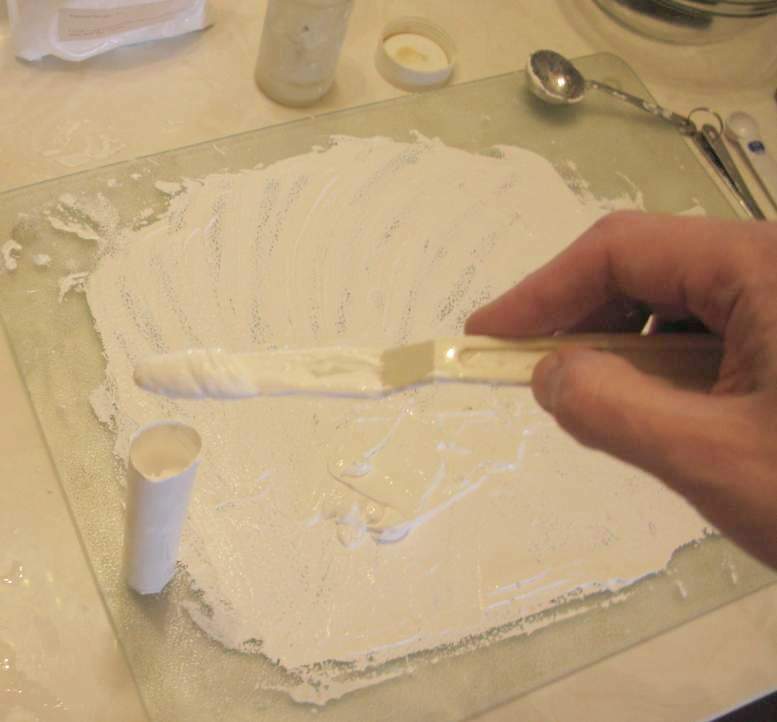 I seal the ends by squeezing it shut at about 1/2 inch below the end. to give me enough room to crimp. 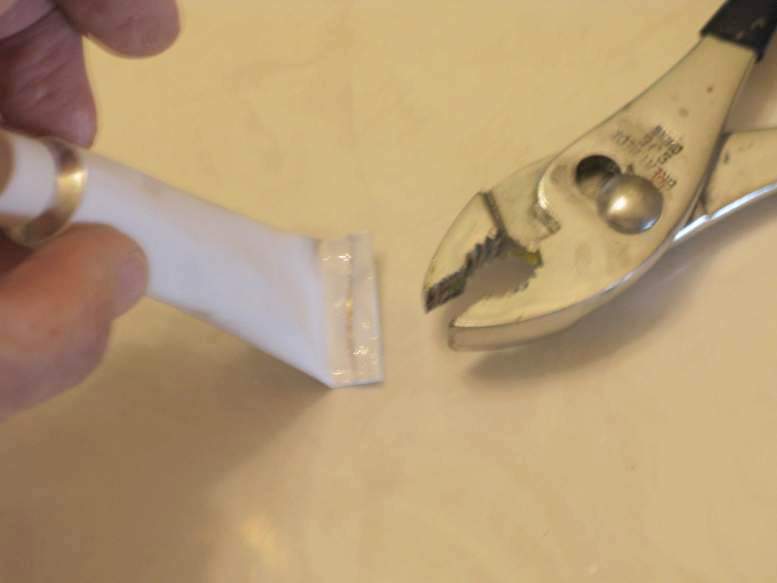 I fold over a little of the end, and crimp it tight with some pliers, and repeat this about 2 more times to get a tight seal. Here I have two tubes of white casein labeled and ready to use. I was browsing around on the internet this morning looking at drawing tools, and I stumbled across a youtube video of a fellow making a proportional drawing caliper. I’ve used these before, but lost the one I had bought some time ago. This sounded like a good project to fuss around with. A drawing caliper is a measuring device made of two crossing sticks that allows you to scale up a measured distance depending on where you attach their intersection point. For example, if you set the small end to be 1 inch apart, with the center screw set to 2X, the points at the other end will be 2 inches apart. As long as that intersecting point stays the same, all your measurements will have the same proportion. 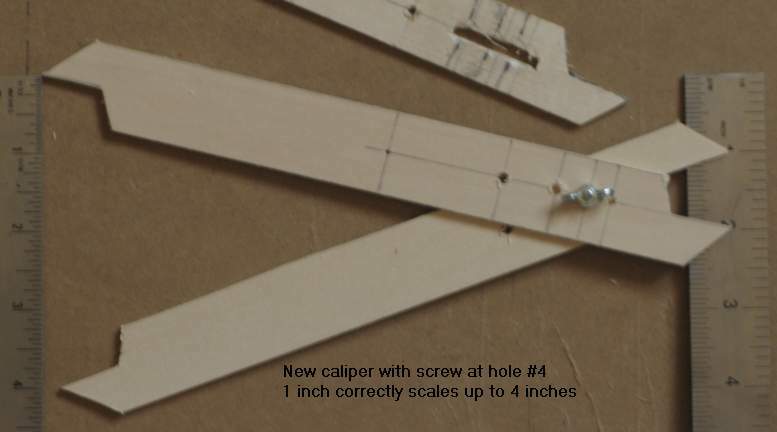 There are commercial calipers you can buy, such as this one from AccuraSee, but the one in Jen’s video looked pretty easy to make, and it was; however, I discovered a problem with three of the hole placements. I decided to make mine out of two strips of balsa wood (3/32″ thick), being easy to cut and shape and not too flimsy. A 6/32″ screw and wingnut holds the pieces together. 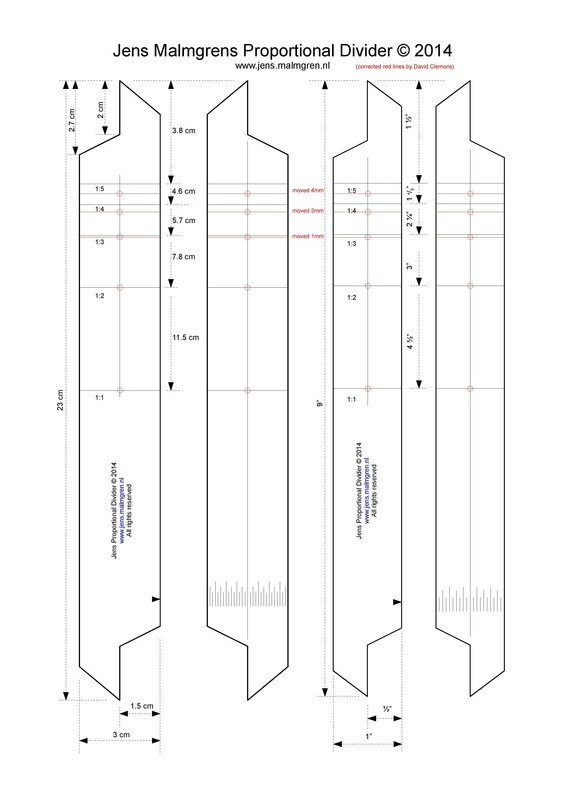 I printed out Jen’s diagram that he linked to on the video, and used that as a template for the balsa (1″ wide, 9″ long.) I drilled 5 holes according to his diagram, and tested the scaling by lining up the two ends with two rulers. The 1:1 scale in the center was easy to test since it’s in the direct center of the 9 inch strip. Hole #2 also measured out correctly by scaling up 1 inch to 2 inches on the other end, as you can see above. There was a problem, however, with the three other holes not being placed correctly. The 3rd hole should have read 3 inches, but instead I got 3 5/8 inches. hole #4 was 4 7/16, and hole #5 was 5 9/16. I needed to make a new caliper with those three holes in different spots, and to do that I cut a slot between the three holes with this opening moved slightly forward (towards hole #2.) That way I can adjust the placement of the screw to figure out the new location. Doing this, I discovered hole #3 needed to move 1mm in Jen’s diagram, hole #4 moves 3mm, and hole #5 moves 4mm. Just that tiny adjustment made a huge difference on the other end. I made marks on the balsa strip where the new holes needed to be, and cut and shaped two new strips of balsa. Now the calipers scale correctly in measurements of 1:1 up to 1:5. Below is Jen’s diagram that I’ve marked up with red lines showing the new placements. You can print this out, and see for yourself if it works to your liking. Balsa doesn’t drill very well, so I may make a new one later out of stronger wood, like oak. Here’s the final version, at least for now. The size is about 10 x 16.5″. 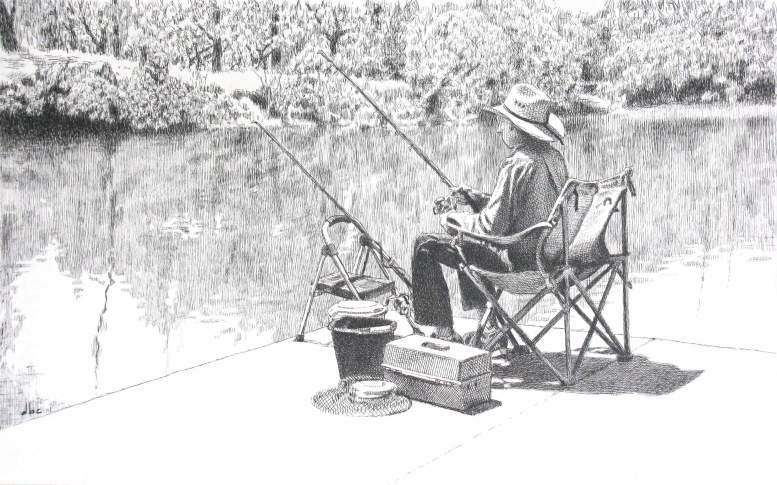 I was debating whether to shade in the concrete pier. I decided not to since I didn’t want that “X” shape it would create in the center. I’ll let it sit for awhile, and see if it needs any touching up. 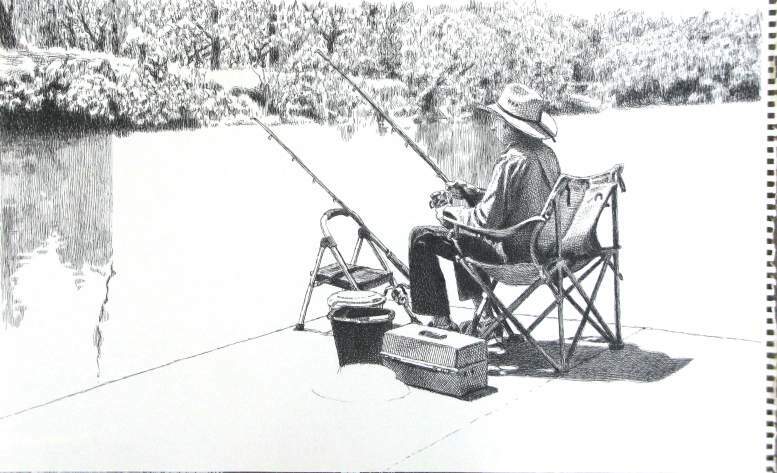 I’ve got the far shoreline placed, and have begun drawing in the water. It’s looking a little tilted on the right side, but I’ll straighten it out later. 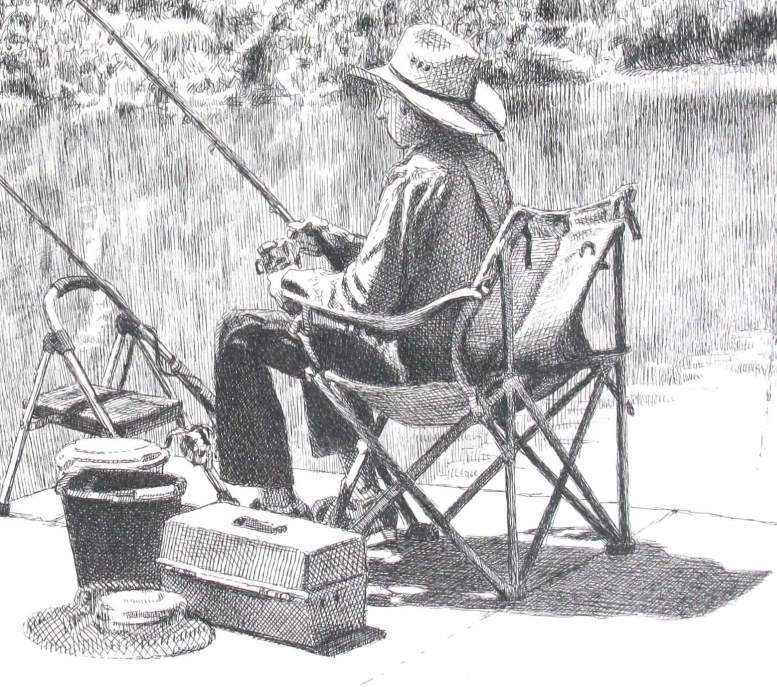 You are currently browsing the Artwork by D. B. Clemons blog archives for July, 2017.